Will and Scott work on the roofing, leaving the east side unfinished until the studio is ready for its roofing. 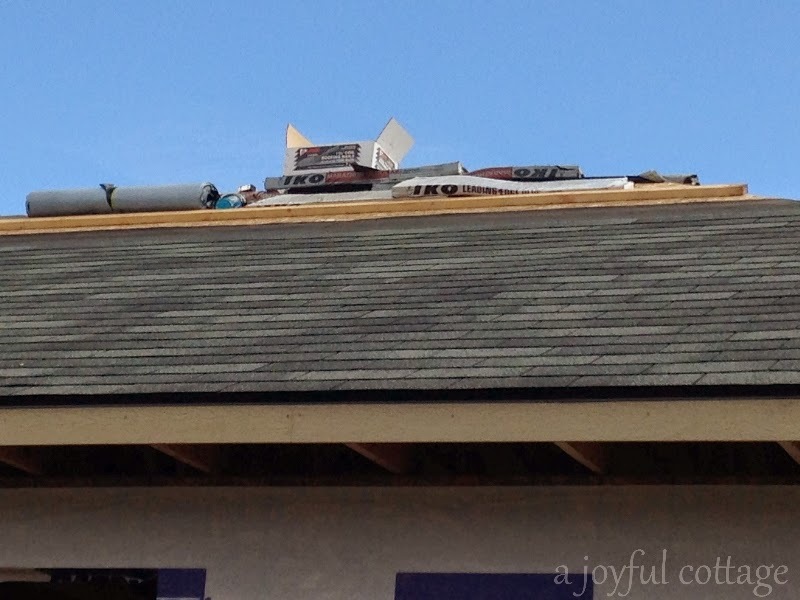 At that time they'll tie it in with the cottage, completing all the roofing at once. I'm happy with the charcoal gray shingle we chose. Scott had a well-deserved day off. 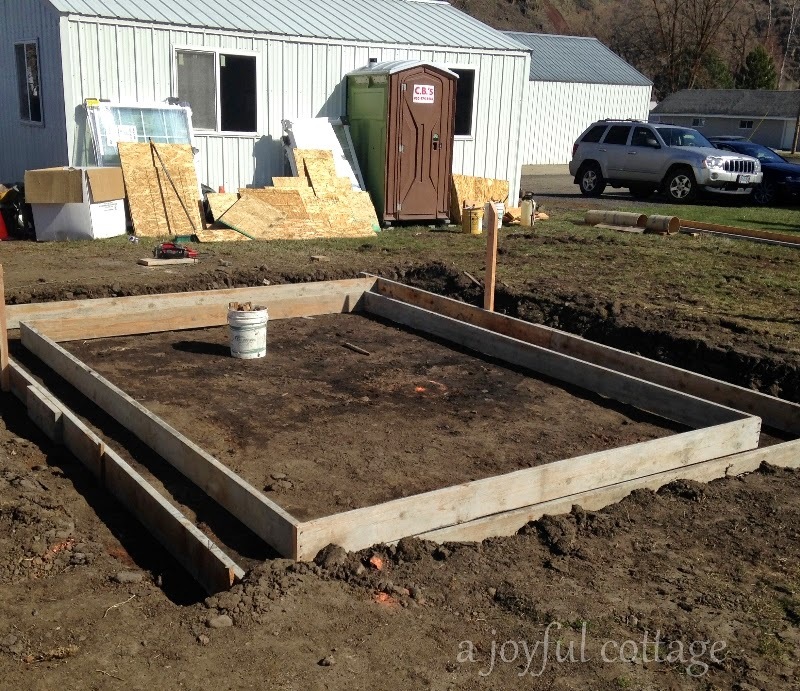 Will builds the forms for the studio's foundation. Dennis and I aren't around to see the installation. We drive to Walla Walla, Washington for shopping and lunch. 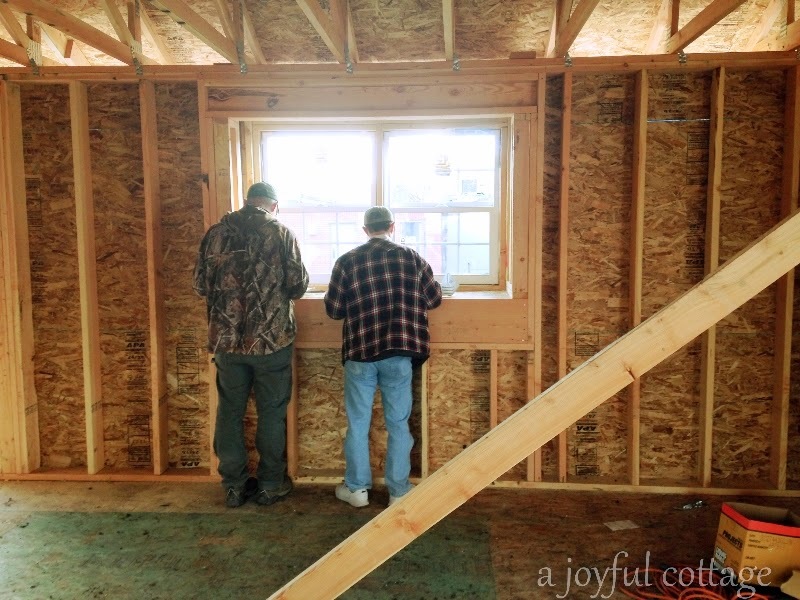 Seeing the cottage with all the windows installed is exciting. 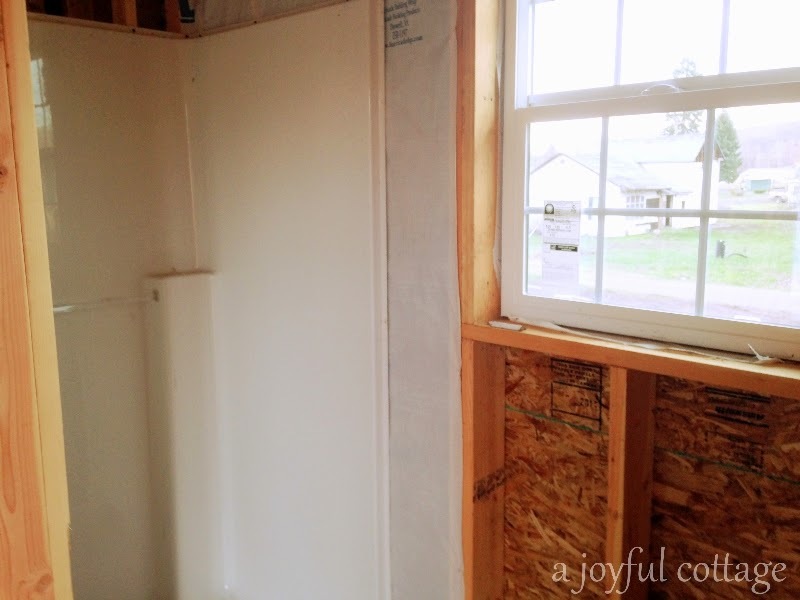 In keeping with our budget we chose single hung, vinyl windows. Wood is tempting for that "authentic" look, but really vinyl will be much easier to maintain over the years, and I'd rather spend money on other things that matter much more to me. I'm very satisfied with the Pella windows. 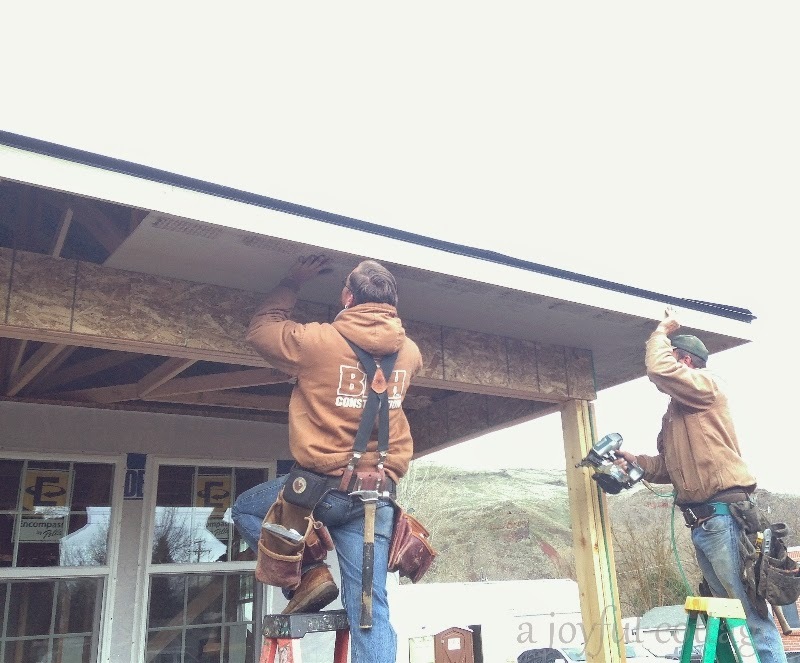 Scott and Will begin work on the soffit. Here you see a close up of the soffit venting. I won't bore you with details about venting, but if you're interested in why and how it's used here's a good article from Fine Homebuilding: A Crash Course In Roof Venting. 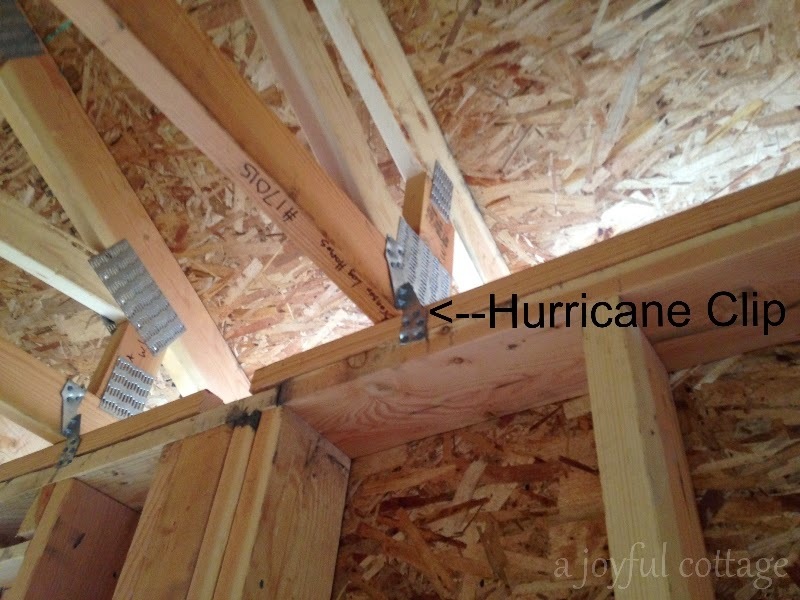 Meanwhile, inside the cottage hurricane clips are attached to the roof truss. We can get some pretty high winds here, so it's good to have these. We meet at the site to review kitchen details with Dean, and Jason of Miller Cabinetry. Dean and Jason go over the measurements. 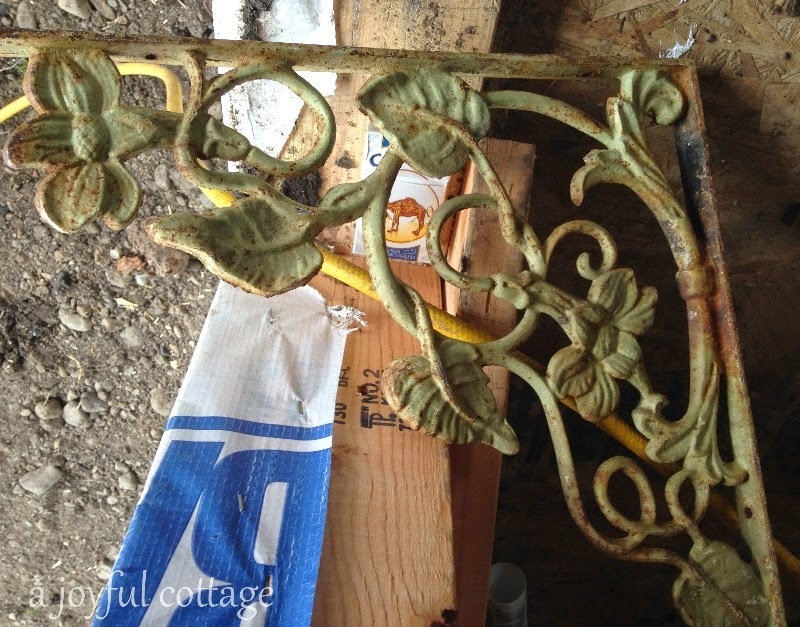 While we were shopping in Walla Walla, Dennis found antique brackets that we will use under our garden window (exterior). Even though we think the patina on these is wonderful, since we're using them outdoors we've decided to have them sand blasted and powder coated white. 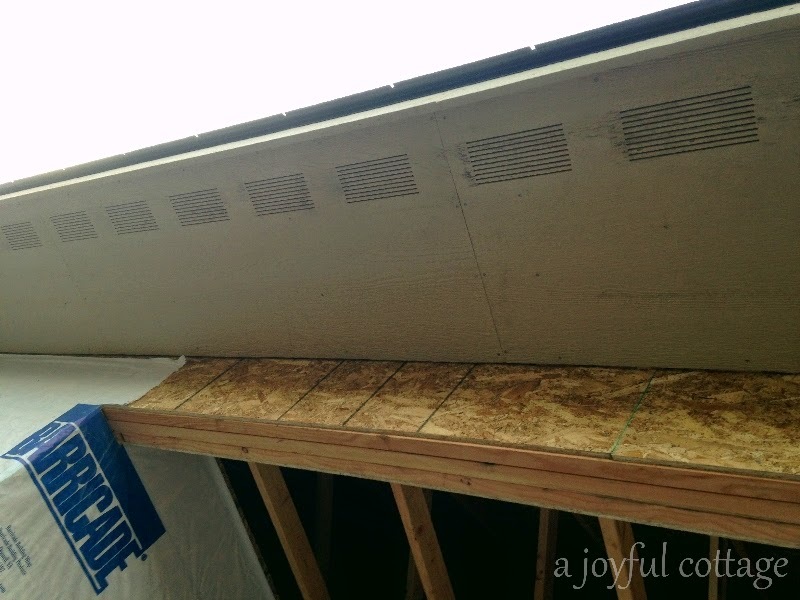 They'll match the window trim and will hold up well to the elements. 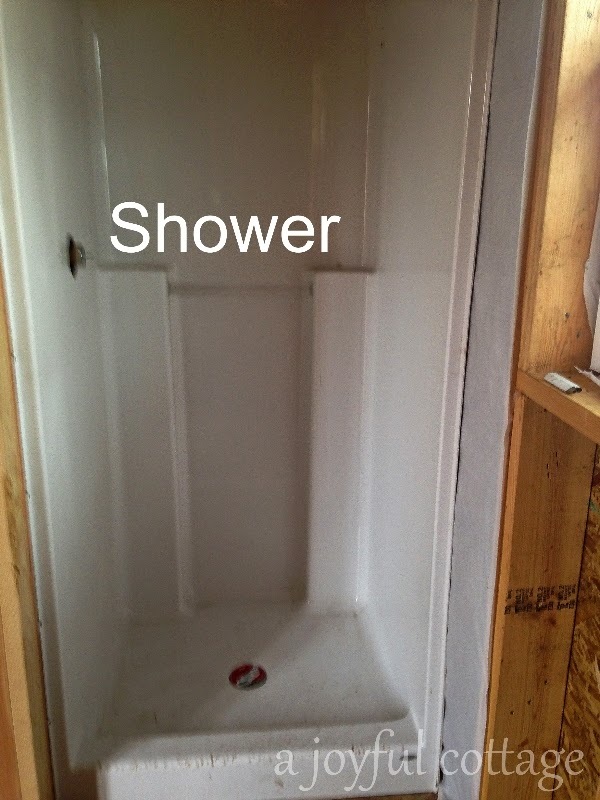 Russell Plumbing completes the rough plumbing. 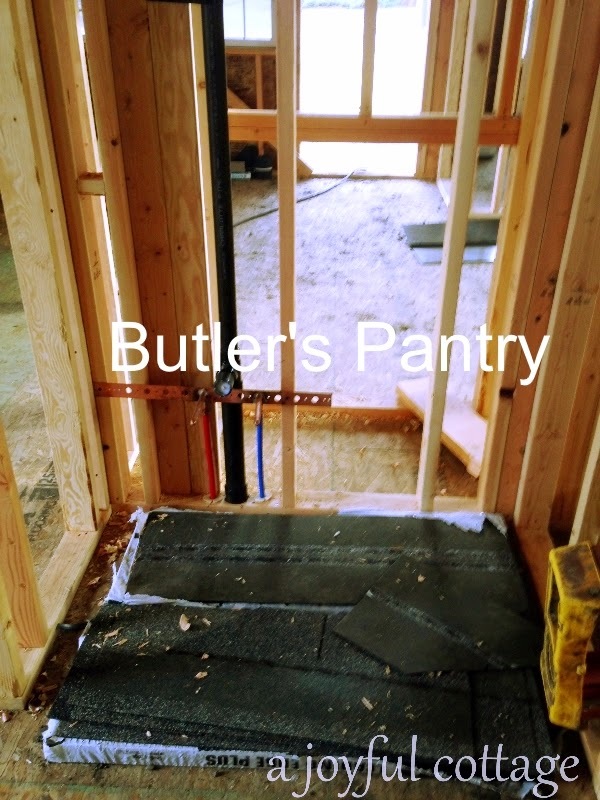 The butler's pantry will have a bar size stainless steel sink. It's Saturday. Dennis and I drive out to the job site and walk through the cottage. 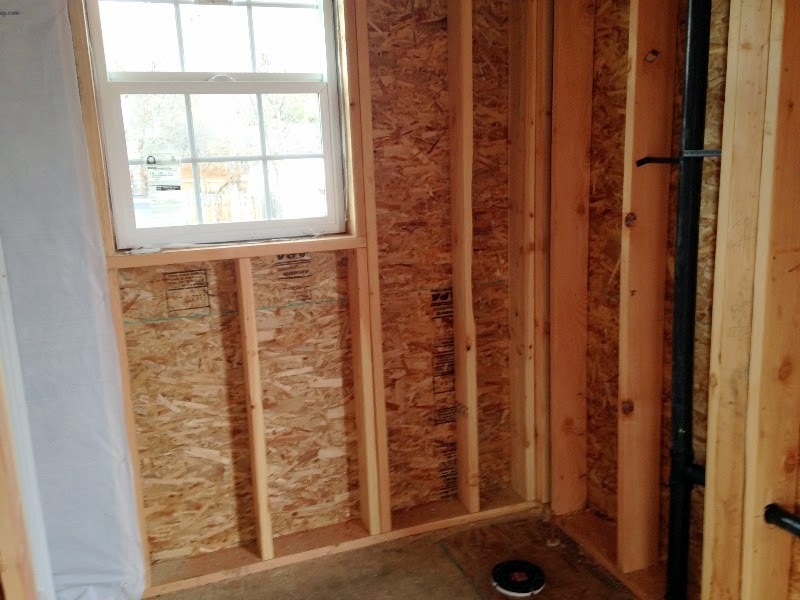 The fireplace will have a gas heating stove. Someone asked what we would be putting in the kitchen window. The answer is potted herbs and flowers. A grow light, for use in winter months, will be hidden in the soffit. 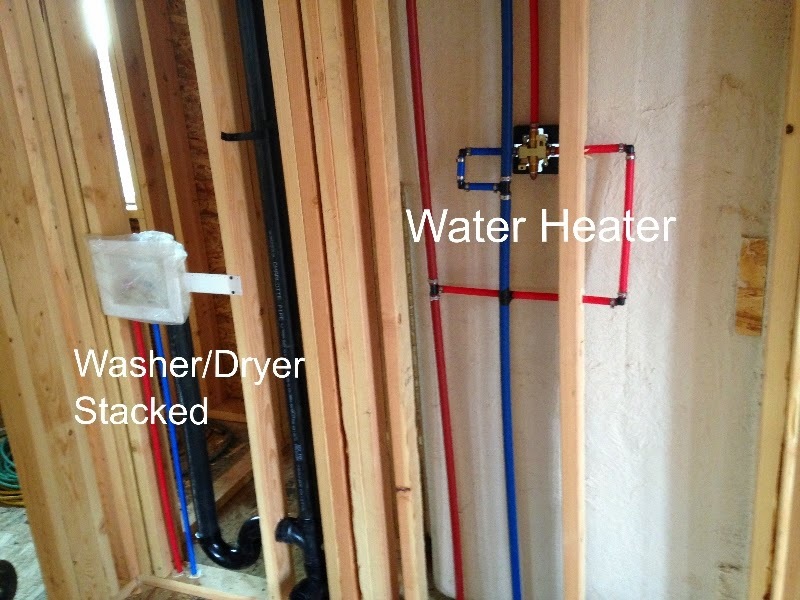 The utility closet houses the stacked washer and dryer, water heater and storage. 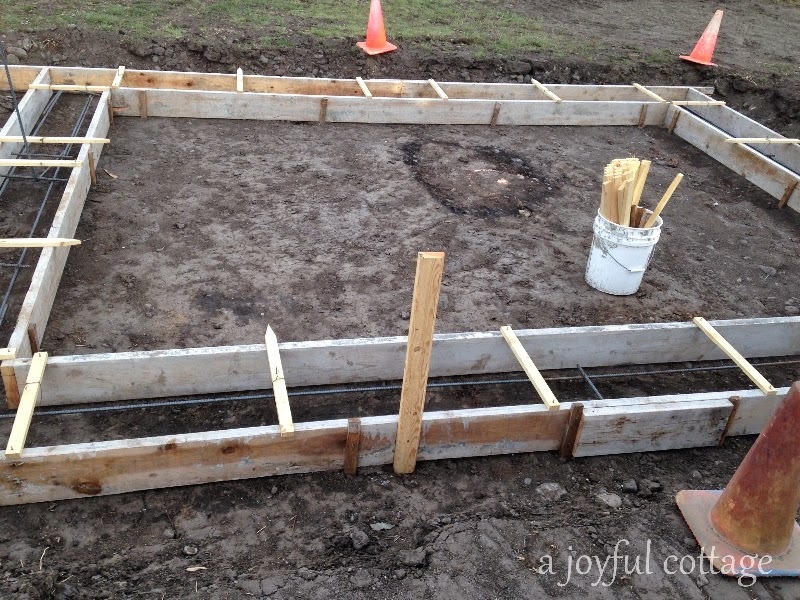 The studio foundation forms are ready for the concrete pour, and the roof truss has been ordered. I love following all of this, Nancy! 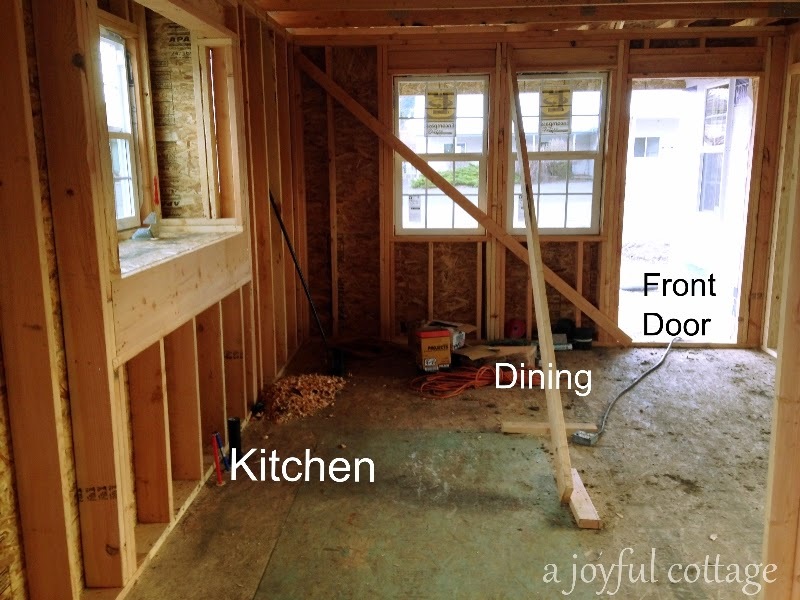 My favorite part so far is your kitchen window with the hidden grow light! Genius! I love seeing your progress. Thanks for sharing. Wow, what an exciting project. You really have thought of everything Nancy. I cannot wait to see the end result. Thank you for the update. I've been thinking of you and wondering who things were going. Now we know! 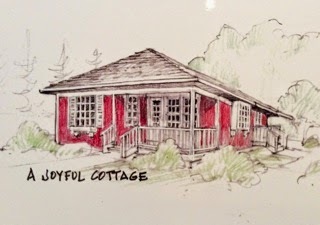 It's exciting to watch your sweet cottage become reality. It's only going to get better and it won't be too long before you can show us your finished - and furnished - new home. Can't wait to see more! Hello, just found your blog. This project is so exciting, I'm looking forward to following your progress. Nice to meet you, Polly. Glad to have you joining me on the journey! 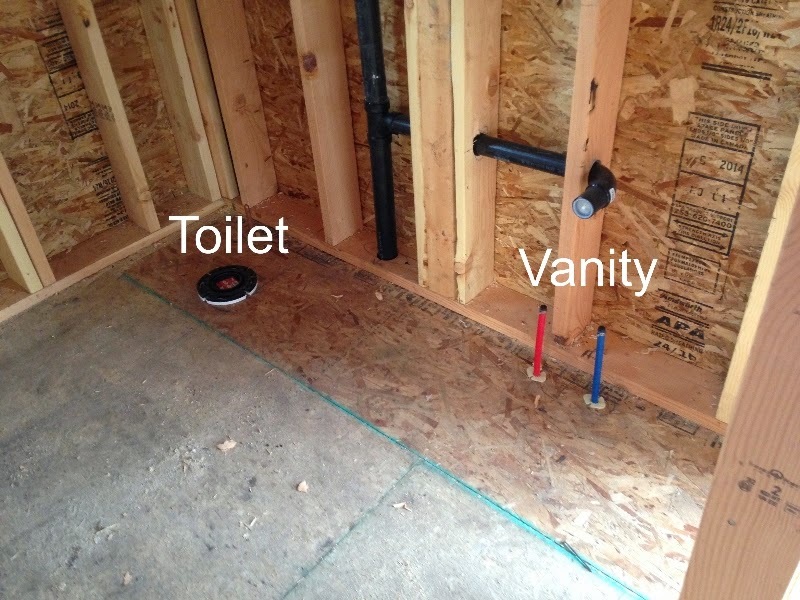 It's really look great, Nancy! I love those iron brackets that you found...perfect! 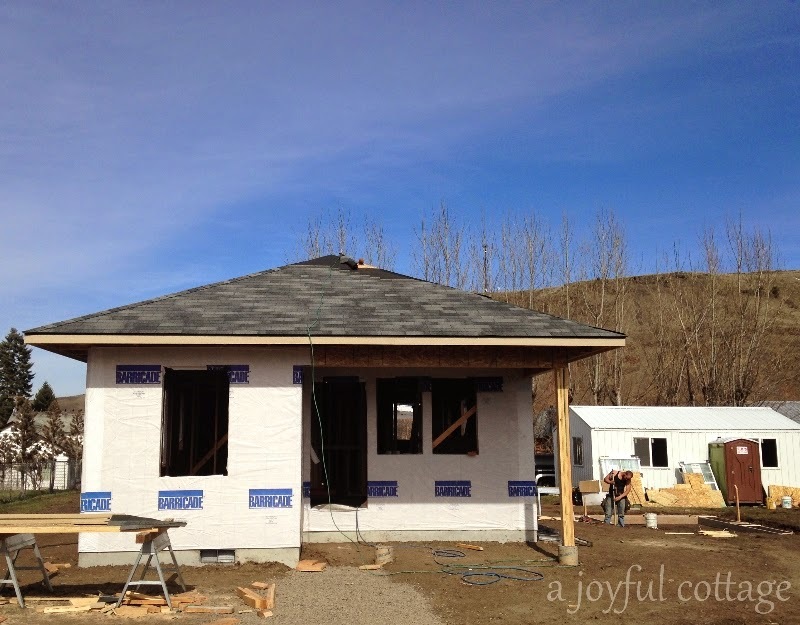 Wowie Nancy what fantastic lightening fast progress, Your cottage will be adorable and I feel privileged reading, viewing and following the progress reports. I am so excited and happy for you and hubby. 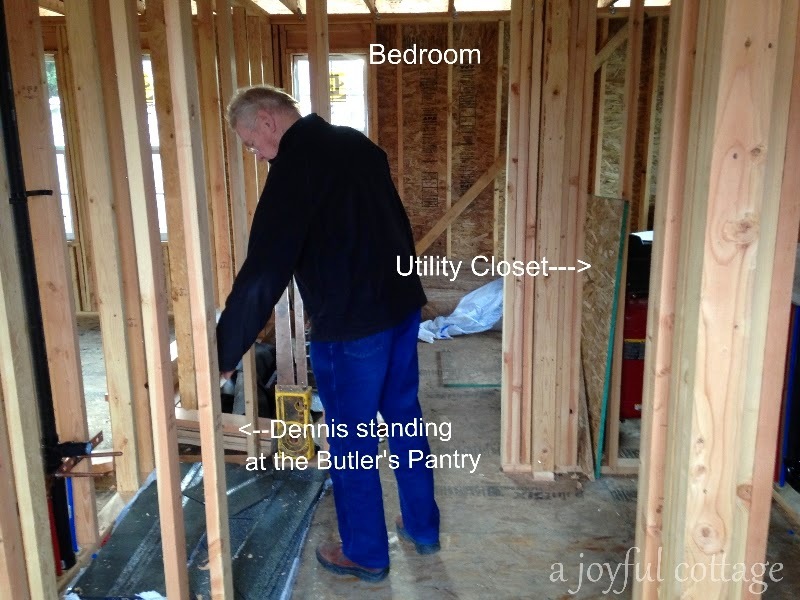 Ok... so I just learned something today - a butler's pantry! I'd never heard of it (maybe I'm too far back in the backwoods or something), but! ... wow what a great idea! Now, I just can't wait to see what your butler's pantry is going to look like (after I looked at images on google to see WHAT it was,lol!) Anyway, so pleased to see the amazing progress on your cottage! You must be just beside yourself to get moved over there so you can be closer to the action. When are you moving? I am loving all of it, and too - I was really glad to see "Nancy's space"! 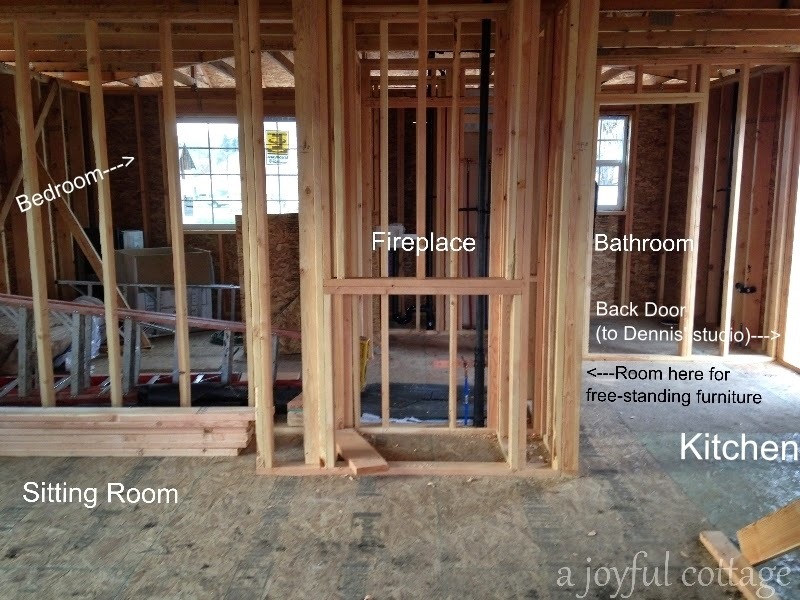 How awesome that in a 600+ sf house you are going to have your very own space - wow! I'm so excited for you Nancy, and can't wait for updates... !!!! Blessings and hugs to you today! Thanks. I'm enjoy sharing it. So excited to see the date by date progress. Love the charm I can see already! Oh Nancy it is all coming together so nicely. How super exciting this all is. This is like reading a great story I can't wait for the next page. Looking forward to the next post on the progress. 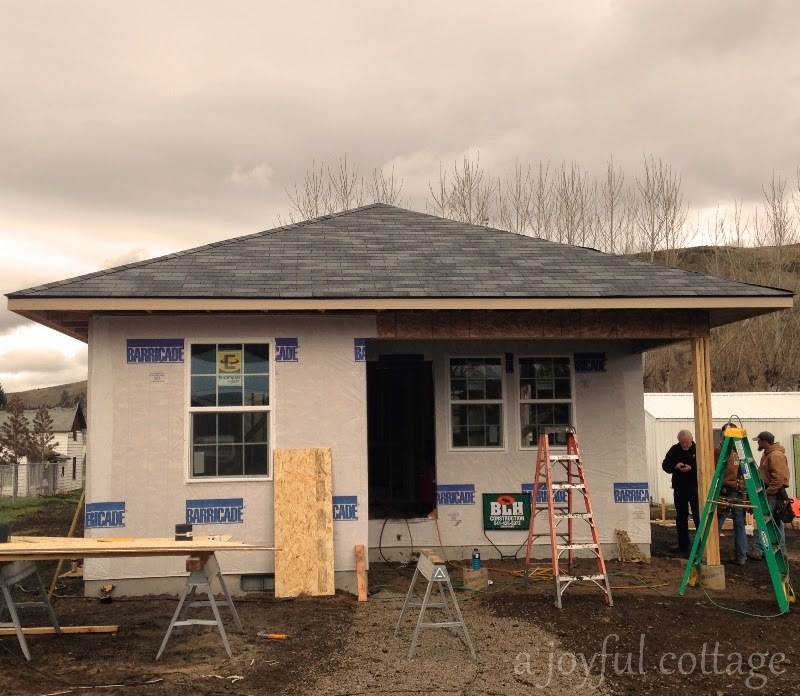 Wooo Hooo it is becoming a beautiful little cottage. It's such FUN following along and watching everything unfold! I'm amazed at the fast progress. 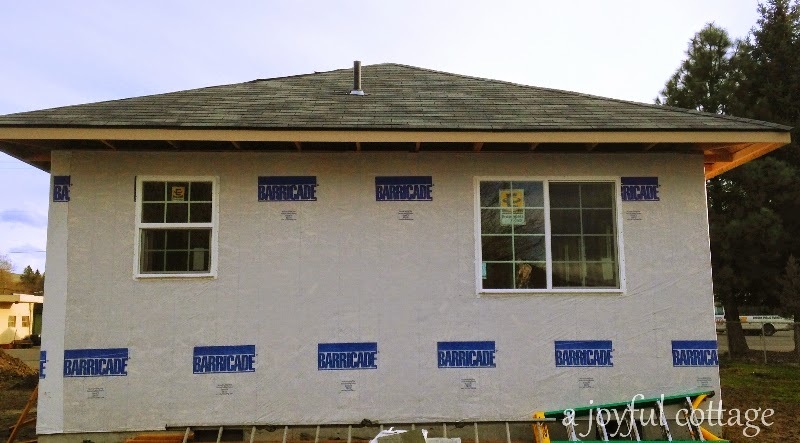 Now that the windows are in place, you must be getting over-the-moon excited. It's going to be really lovely! Thank you for sharing as you go. It is fun. I like the window so much. And I am excited to see how the lighting is installed. What a great idea. I will be taking a few days off from blog land. Taking time to enjoy my family and celebrate Easter. So exciting to see it all come together a little more...I will definitely stay tuned! 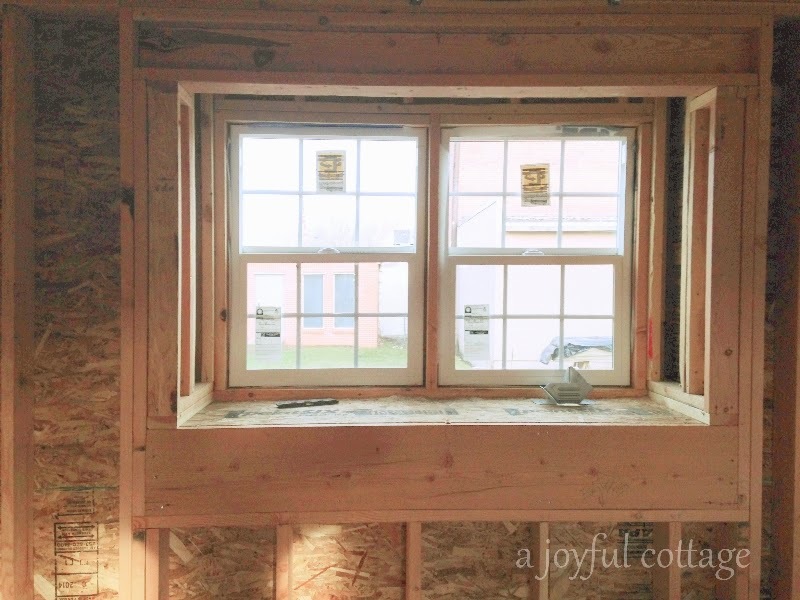 The windows look wonderful, especially that kitchen window which is such a charming addition. I've had vinyl windows installed too because they last so much longer and you don't have to paint them in a few years, but I think if you chose the right style (as you obviously have) it makes such a difference. It's great that you're both going to have your own spaces. I love following the progress. I does look a lot like a home once the windows are one. I love the ones you chose, the one in the kitchen is really charming. Great progress Nancy! The windows are perfect,,,I love windows and you have chosen such a nice cottagey feel with these. Things are coming along and I love getting your progress posts! Can't wait until you can decorate!! Take care. 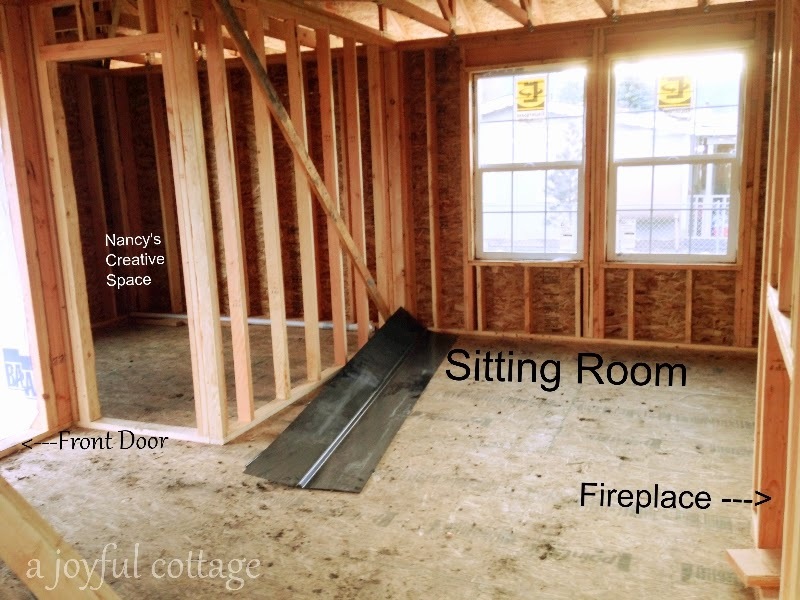 So exciting Nancy - and you seem to have thought of so many details ahead of time - great planning and much needed when they require hiding places in the walls! Love the idea of the 'grow light' for herbs etc. Keep sharing the journey - such fun. I love seeing the progress, Nancy, and all the work behind it. I'm amazed by the amount of thought, planning, details and scheduling required. What a project! Oh my!! 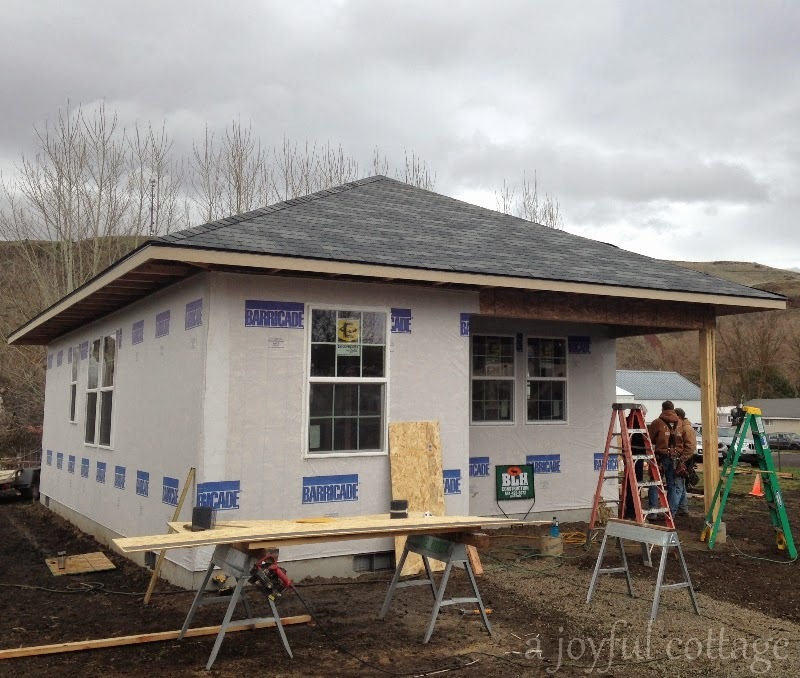 Amazing progress, Nancy, and it's actually starting to look a lot like Dennis' sketch, which means you are getting closer and closer to your dream home, with every structural addition. 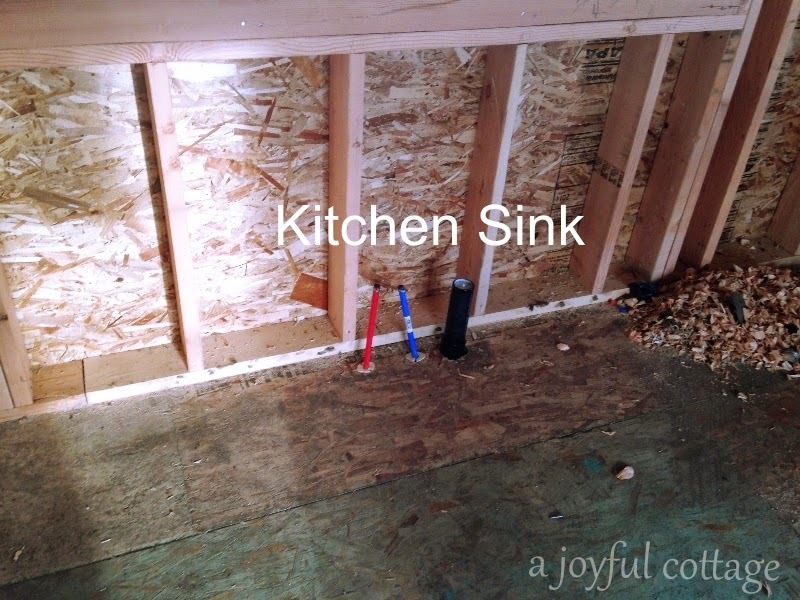 I know how exciting that feels; I never thought I'd be tickled pink over plumbing pipes sprouting from my floors, but I was! Looking mighty magnificent, my friend, thanks for the update! I love seeing your progress. It's really coming along! My gosh so much has happened since my last visit to your blog! I can't believe how much progress has been made already. Isn't it funny how when windows are added it suddenly feels like a house? Can't wait to see the studio come together, too! So good that this is all moving along so well. I enjoy watching the 'bones' develop and find it so interesting to have a window on the decision process! Oh, how exciting, Nancy! It's really coming along wonderfully!!! I am sure this must be very, very exciting and it is very interesting to read your reports and see how it all comes together. 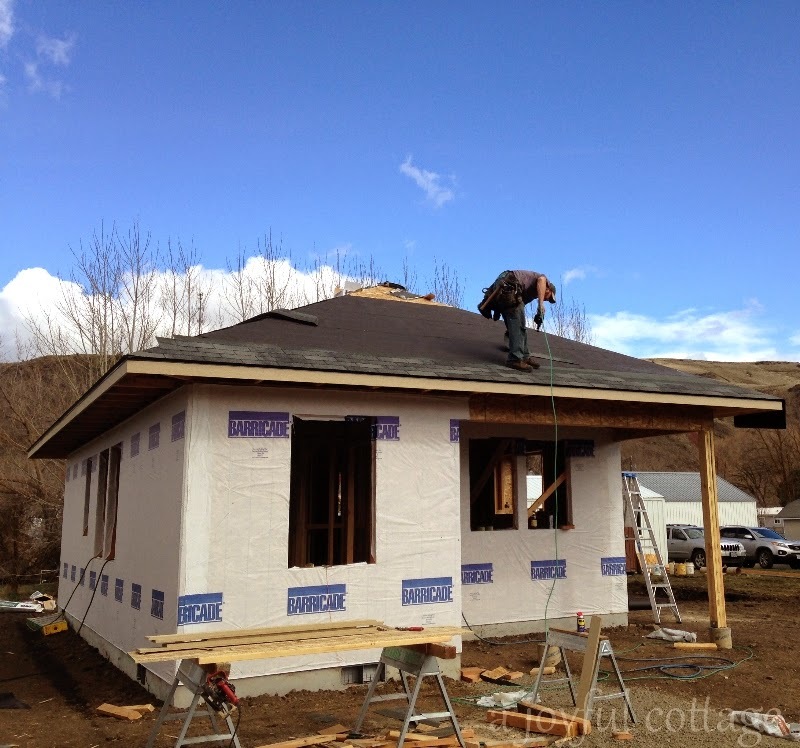 Still amazed how quickly your cottage is going up! It's really starting to take shape. Thanks for the labels, it's great to see what rooms are going where! It's looking great! Nancy, it looks like you are getting close to the finish line! 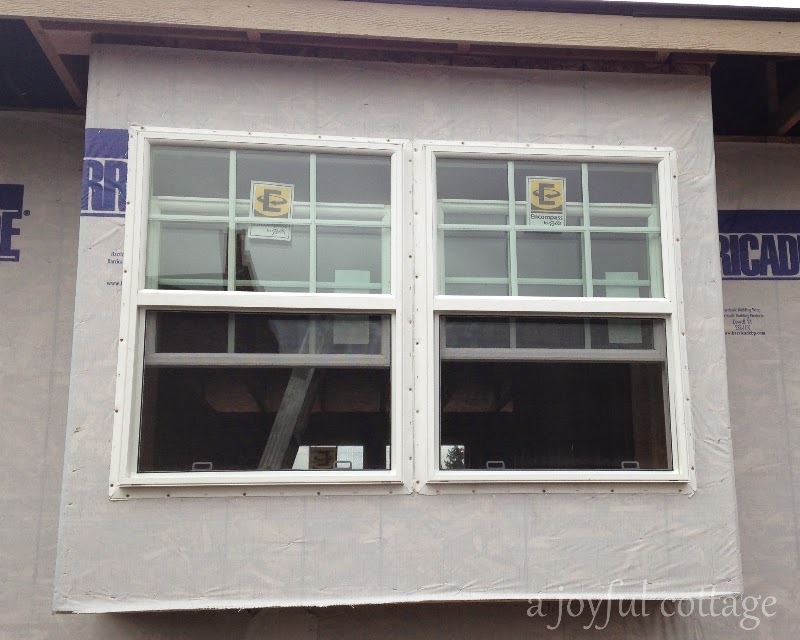 We went with Pella vinyl windows too for the same reasons-- cost and low maintenance.